Saved from the Titanic (Dorothy Gibson's version or mine) is only one of the movies made about the wreck of the great ship. We don't have that one for you, because the only surviving copies were burned with the Eclair Studios in 1914. We loves our Wikipedia, we do. Wikipedia is what keeps us smart. And here's a newsreel tour of Olympic in the early 1920s, showing people actually moving through a ship almost like Titanic. Gosh, that Grand Staircase was actually pretty small. The second movie about Titanic was directed by the Romanian Mime Misu, who also played Captain Smith. 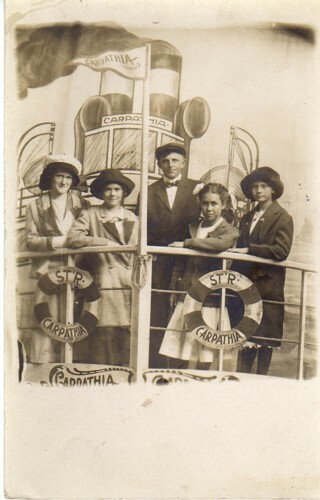 Shot largely on the German liner Kaiserin Augusta Victoria, it provides lengthy scenes of life on board a Titanic-era liner. Long thought lost, In Night and Ice was rediscovered by a German collector in 1998--and here it is on YouTube. E.A. Dupont's career hit an iceberg with this very early talkie, done in English and German versions. Talkies were still really difficult to film, requiring the actors to stand still while the microphones sucked up their voices. So we have a series of agonizingly slow two-shots featuring actors intoning such immortal lines as "Who...can...say?" But there are actually some fairly good wreck scenes and a truly eerie ending (no spoilers here). Cunard fans: Majestic stood in for Titanic. Produced as Nazi propaganda, commissioned directly by Joseph Goebbels, Titanik was even harder on its director than Atlantic: after offending Goebbels, the first director, Herbert Selpin, was arrested and later found hung in his cell. In the film's retelling of the story, cowardly, capitalistic Bruce Ismay and Captain Smith sacrifice passengers to raise the value of White Star stock, while a heroic but entirely fictitious German officer saves lives. The Cap Arcona stood in for Titanic. Tragically, just days beore the end of World War II, the Germans filled the Cap Arcona with concentration camp survivors and staked it out as a decoy ship, hoping the British would bomb it instead of a ship holding fleeing Nazis. They got their wish. The British bombed and sunk the Cap Arcona. Of over 5000 concentration camp survivors on board, only 350 survived. There's a story for one of you out there. Your mileage may differ, but I love it. 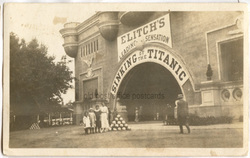 Get the version with all the extras and you'll see Ed and Karen Kamuda of the Titanic Historical Society, Don Lynch, and Ken Marschall, who have done so much to bring Titanic back to life. Cameron's cynical attempt to cash in on the success of Titanic? Not at all. The way he stages the wreck will bring tears to your eyes. There are three really awful Titanic animated movies for children. Think "Disney does Titanic" and you won't even get close. Titanic: The Legend Goes On has the distinction of repeatedly having been named the worst children's animated movie ever. But then there's Tentacolino. Titanic Sinks in Real Time, created by the programmers of the game Titanic Honor and Glory, which you should pre-buy because they are wonderful people and completely fixated on recreating an entire digital version of the ship. "The Collision Sequence of Events", a lovely geeky mini-documentary by the Titanic Honor and Glory gang and Titanic expert Parks Stephenson. Bless them, they filmed this in the remaining bits of the Olympic First Class Lounge. Look at the background and you'll see what a bit of first-class Titanic looked like.